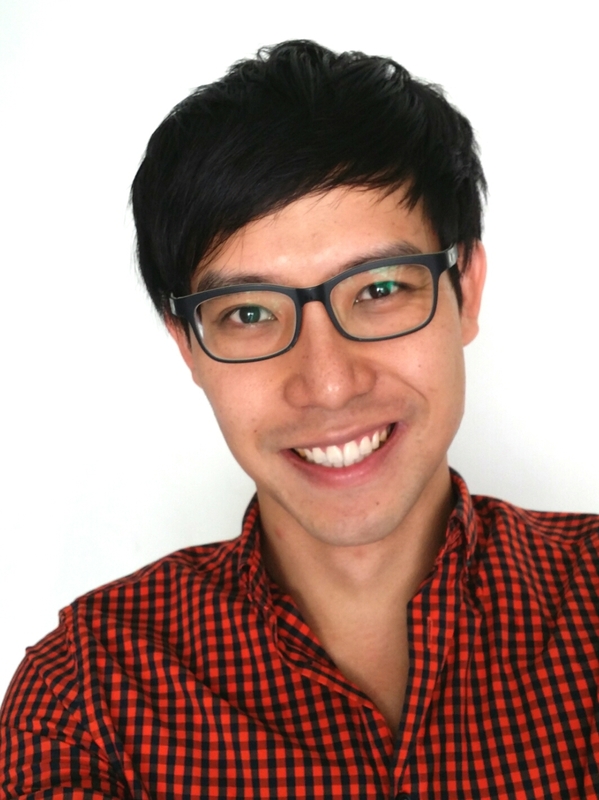 This is a joint article written by Leong Sze Hian and Roy Ngerng from The Heart Truths. This article was originally published on The Online Citizen. 4,297 undischarged bankrupts in 1984? The number of undischarged bankrupts in Singapore was 4,297 in 1984. S’PORE HAS MOST BANKRUPTS PER MILLION PEOPLE IN REGION. Highest number of bankrupts per million population in the region in 1997? By 1997, Singapore had the highest number of bankrupts per million population in the region. The number of discharged bankrupts was 1,926 in 1996. At the end of 1996, Singapore had 13,696 undischarged bankrupts – or 4,033 per million population. There were 1,252 new bankrupts in 1996. 25,061 undischarged bankrupts in 2011? In 2011, Singapore had 25,061 undischarged bankrupts, and together they were in debt to the tune of at least $2.2 billion. Undischarged bankrupts increase from 4,297 in 1984 to 25,061 in 2012? Comment: The number of undischarged bankrupts had increased from 4,297 in 1984 to 25,061 in 2012.In 2011, the number discharged from bankruptcy was was 1,391, compared to 1,926 in 1996. How many discharged bankrupts in total over the years? As there are no cumulative statistics on the total number discharged from bankruptcy over the years, how many discharged bankrupts are there in addition to the 25,061 undischarged bankrupts in 2011? The number of new bankrupts has increased from 1,252 in 1996 to about 2,000 a year, in recent years. Not many cannot pay in 1989? FEWER and fewer people have relied on free medical care at the SingaporeGeneralHospital and government hospitals in the past three years. Between April and December last year, 465 bills were remitted at these hospitals, compared to 689 in financial year 1988, and 758 in 1987.
compared to 157 for 1988 and 142 for 1987. At government hospitals, such as Toa Payoh and Kandang Kerbau, 323 in-patien t bills were remitted last year (April-Dec), 532 in 1988 and 616 in 1987. There were also 6,786 free cases – destitute cases, those on the public assistance scheme or with medical fee exemption cards – at government hospitals, and 269 at SGH (April-Dec ’89). Figures for 1987 and 1988 were not available. As for outpatient bills, excluding free cases, 167 were remitted at government hospitals last year between April and September, compared to 378 for the whole of 1988 and 343 for 1987. In the same period, 64 SGH bills were remitted, compared to 61 for 1988 and 37 for 1987. Over the past two years, SGH bills paid for by more than one Medisave accoun t dropped from 3.1 per cent (’88) to 2.9 per cent (’89) for B1 beds, and from 2.8 per cent (’88) to 2.1 per cent (’89) for B2 beds. 0.5m Medifund successful applications plus 4,000 benefit from hospital charities? 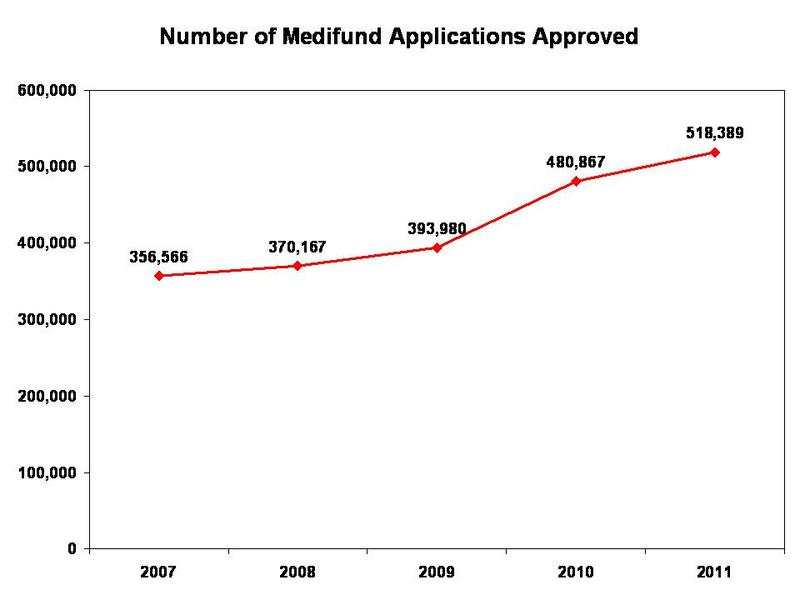 From Chart 1, you can see that the number of applications seeking assistance from Medifund has been increasing every year. 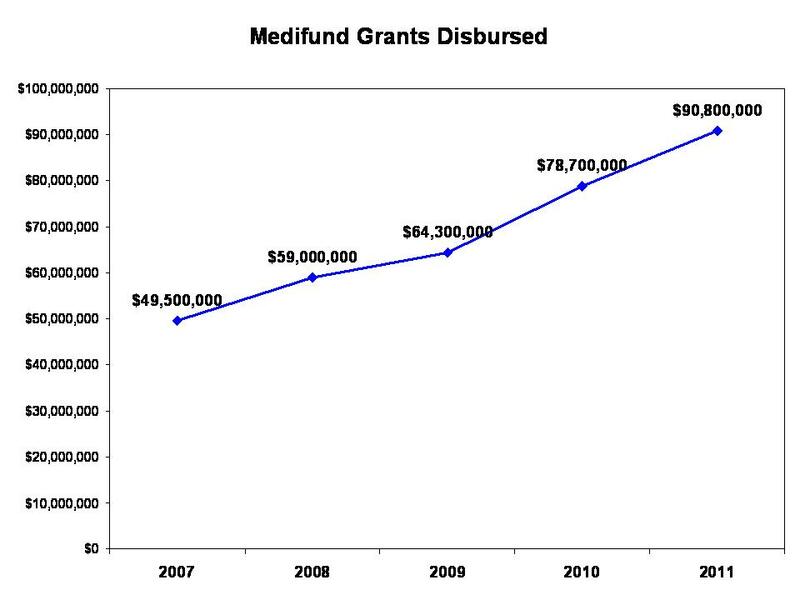 In Chart 2, you can also see that the Medifund grants disbursed has also been increasing every year. In Chart 3, you can see the change in percentage terms. 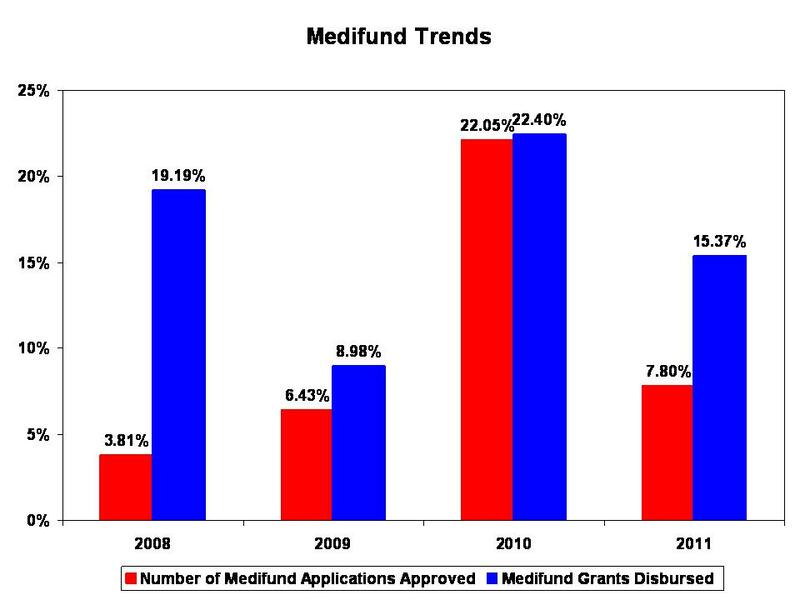 Overall, from 2007 to 2011, there was a 45% increase in the number of Medifund applications approved and a 83% increase in the grants disbursed. However, we are not able to obtain the following information – How many patients needed Medifund assistance? How much were they actual bills? Was Medifund enough to cover them? However, if we perform some simple mathematics, we can see in Chart 4 that the average grant per application is about $160. So how did the $1,295 and $103 come about? Also, if we compare this to the period 1993 to 1995, we can see in Chart 5 when Medifund first started out, the average grant per application was $265. This is peculiar because if healthcare costs are more expensive now than in the 1990s, shouldn’t there be a higher average disbursement now? If not, are patients actually receiving enough financial support through Medifund? Also, sometimes patients find it inconvenient to have to apply for Medifund. On top of that, when they apply for Medifund, they are also required to present the income statements of not only themselves, but of their family members as well. Because of the inconvenience and the embarrassment of having to approach their family members, some patients do not seek Medifund support and would rather miss out on care and treatment and fall even more sickly. If this is so, how many patients are there who need care and support but who are actually not getting it? How many patients have chosen to see their health fail, rather than seek financial support for their medical bills? 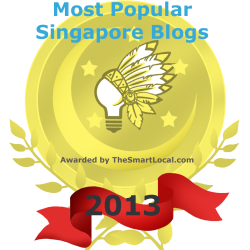 So, is our healthcare system adequate for the poor and elderly in Singapore? Is our healthcare system able to provide for and protect them? Why do we have a system which makes it difficult for the poor to access support, when they are the ones who need the most immediate and easy-to-understand assistance? Can we simplify the system? Already, Singapore is the richest country in the world by GDP per capita. However, the Singapore government spends the lowest proportion of our GDP on healthcare as compared to other developed countries and also spends the lowest proportion out of our healthcare bills. The governments of other countries with a similar GDP per capita to Singapore’s pay for around 80% of the healthcare bills. However, in Singapore, our government pays for just around 30%. With the highest reserves per capita and where GIC and Temasek Holdings, which manage our reserves, are ranked the 8th and 10th largest sovereign wealth funds in the world, the Singapore government can clearly provide more financial support for the poor in Singapore. We need to start a conversation where Singaporeans are provided with the full range of health and financial information and statistics, where we are able to decide how much more funding assistance should be given through Medifund, whether Medifund applications should be made more accessible and even automatic, whether there should be a higher interest rate for our Medisave, or at least for the poor and the elderly, and whether the government should give a higher payout for our Medishield. Increasingly, the robust healthcare system that Singapore has built is being crippled by its lack of care for the poor and elderly. If we are not able to provide for the poor and elderly, no matter how good the healthcare infrastructure is, our healthcare system would have failed the very people that it should serve. In the interest of presenting a balanced view regarding suicide rates. A fact check would show you that the suicide rate in 2006 was actually higher than it is right now. And that China and Japan have roughly double the suicide rate. South Korea has triple the suicide rate of Singapore. information for me. And i’m glad reading your article. But wanna remark on some general things, The site style is great, the articles is really excellent : D.